Packing nothing but the brand's best and brightest, Romeo Y Julieta 4 Pack Sampler brings you four uniquely delicious, handmade Romeo Y Julieta blends. Showcasing one each of the fan-favorite Romeo 1875, Reserva Real, Romeo Anejo, & Romeo by Romeo Y Julieta cigars, this pack is the perfect low-priced introduction to this legendary Cuban-born brand. I am used to mostly mild cigars and this pack had a couple that were a little stronger. I was pleasantly surprised! A Greta Value for these cigars! All four of the cigars where excellent smokes, will be buying them again. I enjoy the variety of the sampler pack. Ok for the money. Did not think they where anything special. Can’t wait to get back home and light one up! I don’t remember which cigar of this sampler I like the best, but I thought everyone were enjoyable. Thanks.. Robust flavor and rich taste. 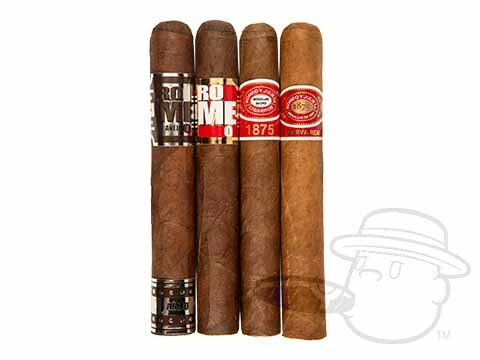 Romeo Y Julieta 4 Pack Sampler is rated 4.3 out of 5 based on 18 customer ratings.